Yesterday, was the 12th day of the 12th month of 2012 (12/12/12) and it's the last time in my lifetime that I'll see a repetitive date. So what better way of commemorating that than by running a marathon put on especially for the occasion?! That was what I thought, as I signed up for my 13th marathon of 2012, the Dirty Dozen put on by Enigma Running... although clearly I should have planned it better and made it my 12th of the year. I got up at 6am the next morning and was greeted by the most incredible view - there had a been a very thick, heavy freezing fog over night, and the trees and the fields were absolutely covered in thick frost - it looked like Narnia out there! It was as cold too... the car told me it was -5oC when I left the house but I had layers, gloves, warm tights and I was ready for the conditions so was really looking forward to my last marathon of the year, and earning the special Christmas medal that went with it! The race was being held in Milton Keynes which is a 90 minute drive from my house, without any traffic, so at least a 2 hour drive in the rush hour. I was quite happy in the car though, listening to my new marathon playlist and admiring the scenery as I was sat in another section of traffic jam. About an hour into the drive, I suddenly, sickeningly, realised what I'd forgotten to bring with me. I didn't have my trainers. As soon as I could, I pulled over and frantically searched the boot of the car to see if, by chance, I had a spare pair hidden in there. I didn't. I thought about whether there was anywhere I could buy a new pair, or whether I could borrow some from anyone, but I was already really tight on the time and this close to Christmas I certainly hadn't budgeted for new trainers! I quickly realised that there really was nothing for it but to turn back and go home. If there was ever going to be a time to have my first go at barefoot running, 26.2 miles in sub-zero temperatures certainly wasn't it! By the time I got home I was decided. As soon as I got in, I let people on twitter and facebook know what an absolute idiot I was, and what a bad start to the day I'd had, before swapping my flipflops for socks and trainers, and headed out at (just after) 9:12am. When everyone else was starting the Enigma Dirty Dozen Marathon, I wanted to be starting too. 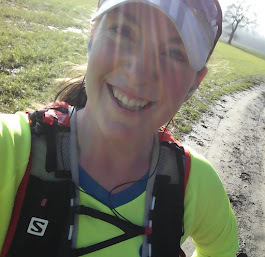 I didn't have a route planned, I was just going to run and see where it took me, but I was determined to get through the distance - despite not having run for so long, it felt pretty good, and I was enjoying myself, especially in light of how very beautiful the countryside was looking in the frost. All I had with me was a bottle of Powerade, and I soon realised I was going to start flagging before the full distance. I hadn't had my customary banana before I started, and have become used to races with food at aid stations, and so after 14 miles, I decided to split my run into two, and headed home for a refuelling stop. I had some lunch, got changed into some fresh clothes, and after a bit of a TV break, headed back out into the cold to finish off. It was incredibly hard work starting again...I was freezing cold, my knees ached, my hip hurt, and I'd eaten too much and got a stitch within about 2 minutes! This certainly was not fun...this was horrendous! I struggled on though, and after about 6 miles, finally felt like I had warmed up again, started settling into the run and I knew I was going to get through it...and get through it I did. I finally made it home again, having covered a total of 26.54 miles in 4hrs 16mins (not counting my 2.5 hour lunch break). I'm really proud of myself that I ran my unofficial solo (two-part) marathon. It was very much harder than running with other people, and I was constantly battling against that little voice in my head that kept telling me that I didn't have to do it. There was no medal waiting at the end, it wasn't going to count towards my 100 Club tally, but I knew that everyone else running the Enigma was going to complete the distance, and I was damn well going to do it too - so I did! Well done. It's really hard doing such long runs by yourself.